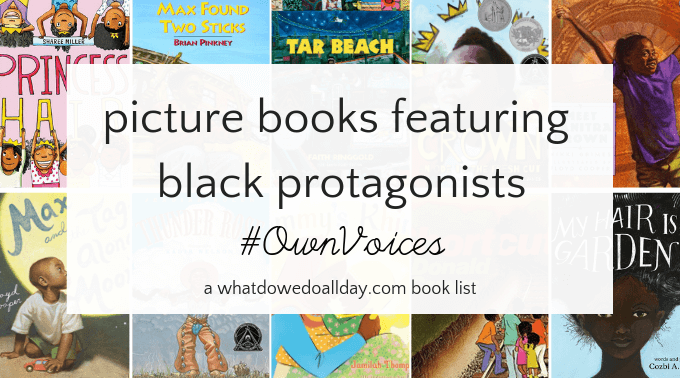 Recently the #OwnVoices movement has been shining a spotlight on the importance of children’s books written by authors from marginalized groups. Part of the diversity movement in publishing is not just to publish more picture books with diverse characters but also to bring more books by minority authors into the world. 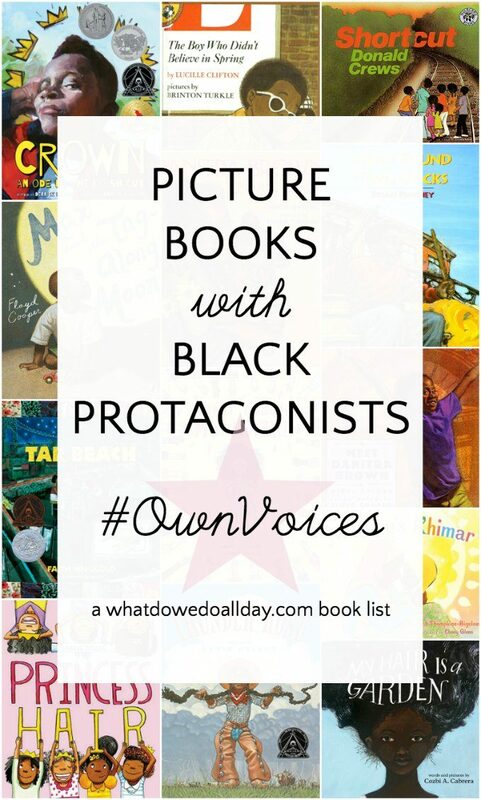 This limited book list features children’s picture books by black authors that my family has enjoyed reading. I’ve included both classic and new titles, but it is not intended to be a comprehensive list. I’ve chosen to focus of realistic (with a couple of exceptions) stories starring black boys and black girls, because I already have several book lists that feature historical narratives. Children must be allowed to see themselves in picture books as they are, and not always represented just as part of a marginalized, oppressed group. In addition, since I am only featuring a single title by each author please check out their other works! Search the companion list, middle grade books by black authors, because I chose not to duplicate authors on the two lists and many of the writers on each list have written for both picture book and chapter book audiences. You can read more about the diversity gap in children’s literature here. Crown: Ode to the Fresh Cut by Derrick Barnes. I absolutely love this book and its energetic illustrations. A strong, rhythmic text describes a boy going into the barbershop and the experience of getting a new, fresh haircut and all the excitement that surrounds the possibilities of what a new haircut might bring–like a look from a girl, or acing an exam. Barnes has a great early chapter book series, too. Max and the Tag-Along Moon by Floyd Cooper. This story reminds me so much of my childhood, when I would watch the moon from the car window just like Max! After he says goodbye to his Grandpa, Max watches the moon following him on the car ride home. The moon passes behind trees, over bridges, along the ridge of hills. He wonders if the moon will always be there for him, just like his Grandpa told him it would be. Floyd Cooper’s illustrations are gorgeous. This is a wonderful book. Meet Danitra Brown by Nikki Grimes is a collection of exuberant poems narrated by a young girl, Zuri Jackson, about her best friend, Danitra. I’ve never read a poetry book like this; it’s a joyful ode to a friend and I love the concept. It would be a great writing project for kids, too — to have them write poems about their friends. Lucky for us, Grimes is a prolific writer; her poetry, picture books and chapter books that are all worth reading. Thunder Rose by Jerdine Nelson is a great American tall tale. My son was a little obsessed with the idea that Rose could speak sentences at birth. “Babies can’t talk!” Well, not only could little Rose speak just after she was born, but she could create balls of lightening and lift a cow and “drink it dry”. As she grows up, she invents barbed wire and lassos a storm to relieve a drought. Kadir Nelson’s fantastic illustrations are a treat. Tar Beach by Faith Ringold is a classic! A family picnics on a hot summer evening on the roof of their Harlem apartment. A young girl imagines coasting through the starry sky on a blanket with her brother over the George Washington Bridge (you would be surprised at how many books there are that feature flights over NYC, I could make a list just about that! ), which her father helped build. The girl’s optimistic dreams of her own future and the possibilities ahead of her do not gloss over the hardship that her family faces. Ringgold’s gorgeous illustrations are quilts come to life. Princess Hair by Sharee Miller. I love this celebration of hair! The colorful, happy illustrations and text share the joy of all different types of hair, both natural and styled! I also enjoyed Miller’s book, Don’t Touch My Hair, a lovely reminder for children to take ownership of themselves. My Hair is a Garden by Cozbi A. Cabrera. Here’s another great hair book! Mackenzie is teased by her classmates for her unruly hair but find comfort and direction from her neighbor, Miss Tillie. I love the way Mackenzie learns to treasure her black hair. In the endnotes, there is even a hair care guide and recipes for natural hair products. Mommy’s Khimar by Jamilah Thompkins-Bigelow. I believe this is the author’s debut picture book and I look forward to what is yet to come! A young girl admires the scarves her mother wears. She takes joy in looking through the closet, dancing with them, trying them on and imagining the possibilities of when she will wear her own. No matter what the reader’s background, every child will see themselves in the young narrator as she celebrates the khimar and the loving relationship she has with her mother. Shortcut by Donald Crews. Crews is best known for his iconic Freight Train book. I love this picture book about a group of kids who decide to take a shortcut by the train tracks on their way home. They have fun playing along the tracks, all the while acknowledging that they perhaps should have gone the usual way! The Boy Who Didn’t Believe in Spring by Lucille Clifton. Chances are, this is a new one for you, but this classic is still readily available and with spring just around the corner, it’s a good time to pick up a copy. A pair of friends in the inner city set about finding the elusive season called “spring.” They venture beyond their usual haunts and when they find it, it is small, but amazing. Max Found Two Sticks by Brian Pinkney. Show your kids than anyone can create a rhythm. I love this book about a boy who starts to beat out musical patterns with two sticks he finds during a breezy day. He taps out the sounds he hears around him in rhythmic patterns. Read it aloud to kids and encourage them to tap out or say their own musical patterns. Pinkney is primarily known as an illustrator and often partners with his author wife Andrea Davis Pinkney who has many several spectacular history picture books (she is on the lists featured below). For those of you who are white (like me), do not shy away from learning about how your perspective that comes from a place of privilege. I recommend the blog Reading While White.